There are many types of window films available on the market, but none compare to the media offer by Ultraflex Systems, Inc. Our perforated window film is a cut above the rest and can allow you to effectively promote your brand while protecting against the heat and glare of the sun. At Ultraflex Systems, Inc., we offer our customers the best products to accommodate all of their digital print media needs. Our UltraVision® Window Perf 60/40 UV is the perfect example of top-quality manufacturing and performance. 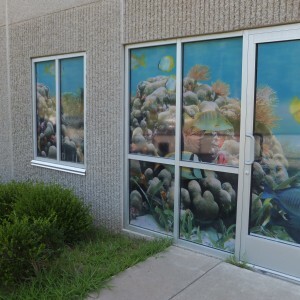 This window film offers features and benefits that are sure to help you grab the attention of your target market. A white-gloss, perforated, calendared graphic film with a black back, UltraVision® Window Perf 60/40 UV is compatible with solvent, eco-solvent, and UV ink printability. In addition, UltraVision® Window Perf 60/40 UV is proven to be an extremely durable film with an extended service life of 18 months to 24 months under normal climate conditions. Ultraflex Systems, Inc. also offers a wide variety of other mesh media products, including our popular UltraMesh® Pro, Strip Mesh Pro LTX, Speaker Mesh, UltraMesh® Blockout, and many others. Each of the products in our mesh media line feature their own unique scrim pattern and construction characteristics and work with solvent, eco-solvent, Latex, and/or UV printers. Ultraflex Systems, Inc. gladly ships products throughout the USA, England, Scotland, Mexico, Canada, and elsewhere worldwide. We are industry leaders and have been serving the digital print media industry for over 25 years. We offer technical data sheets, product samples, and more, so if you need perforated window film for your advertising campaigns, contact us now and let us help you choose the ideal product for your unique application.